This paper describes Knitro 5.0, a C-package for nonlinear optimization that combines complementary approaches to nonlinear optimization to achieve robust performance over a wide range of application requirements. 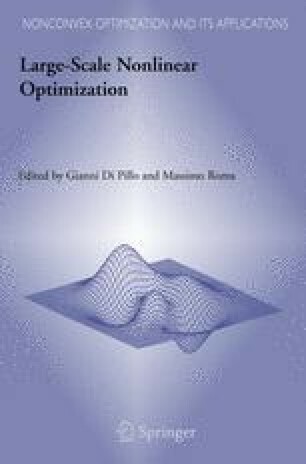 The package is designed for solving large-scale, smooth nonlinear programming problems, and it is also effective for the following special cases: unconstrained optimization, nonlinear systems of equations, least squares, and linear and quadratic programming. Various algorithmic options are available, including two interior methods and an active-set method. The package provides crossover techniques between algorithmic options as well as automatic selection of options and settings. This author was supported by Army Research Office Grants DAAG55-98-1-0176 and DAAD19-02-1-0407, and NSF grants CCR-0219190 and CHE-0205170. These authors were supported by National Science Foundation grants CCR-0219438 and DMI-0422132, and Department of Energy grant DE-FG02-87ER25047-A004.